So, why are Manitoba's skinks in trouble? Manitoba's prairie skinks are considered to be endangered because, so far, they have only been found in one small region of the province. They are isolated from the rest of the North American prairie skink population and their known habitat is shrinking. In short, they are in a leaky boat in the middle of a big lake. Skinks have only been found in the Assiniboine Delta region east of Brandon and in one tiny location in the Lauder Sandhills south of Brandon (see Biogeography). The total area of known skink habitat in Manitoba is less than 1800 square kilometres. The habitat that skinks require is the native mixed-grass prairie that is found in these areas of sandy soils. It is the continuing loss of these native prairies that threatens the prairie skink, as well as many other unique prairie flora and fauna. Humans and their activities are the ultimate culprits in the loss of skink habitat, but these losses are happening in some unexpected ways. Some threats to skink habitat are obvious. When native prairie is converted to crop lands or to housing developments, factories or roadways, skinks can no longer live there. No surprise there, we modern humans have long been creating our own habitat at the expense of the natural world. But it’s not just plowing up native prairies that affects skink habitat. 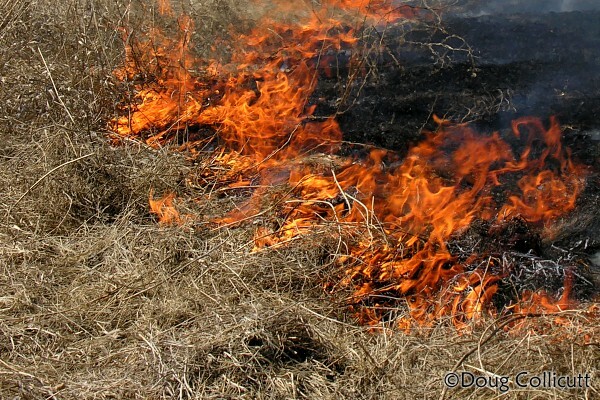 The prairies can be degraded and lost as skink habitat, too. 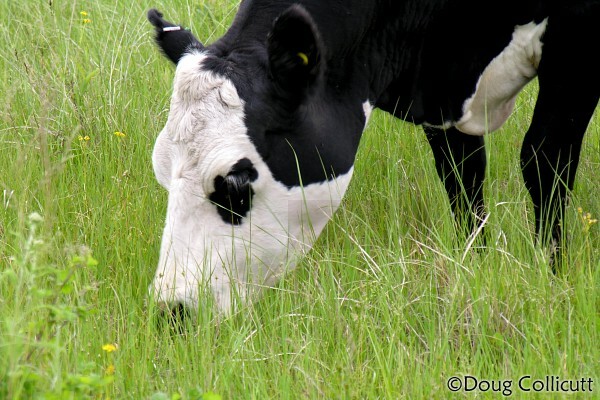 Livestock grazing can help to maintain native grasslands, but overgrazing (too many cattle for too long) can shift the array of plant species in a pasture, making it unsuitable for skinks. 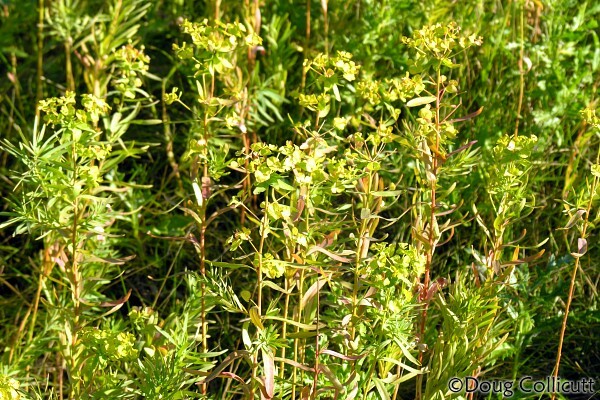 The spread of leafy spurge and other exotic weeds in native prairies can also change the make up of these lands and reduce their value as skink habitat. And last, but certainly not least, is the loss of native prairies to other native vegetation: trees! 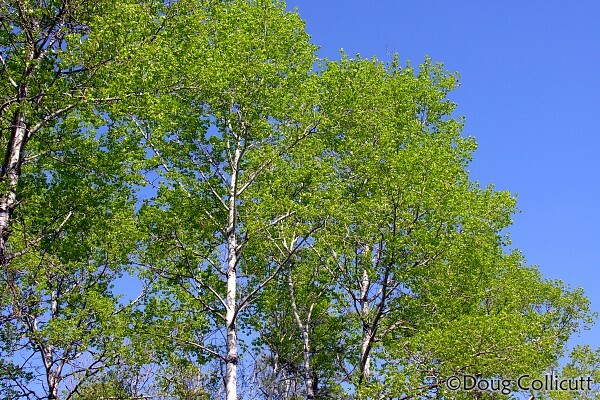 Trembling Aspen, or Poplar, is a native tree species that spreads aggressively into prairies, ultimately turning them into forests. Skinks can’t live in forests. 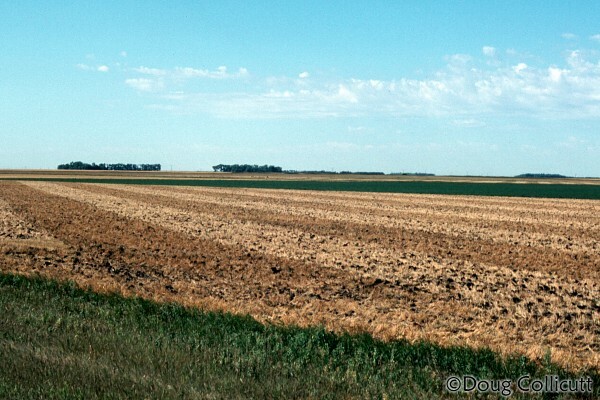 While the process of forests taking over prairies may seem like a natural one, it is, in fact, more the result of humans upsetting the balance of nature again. 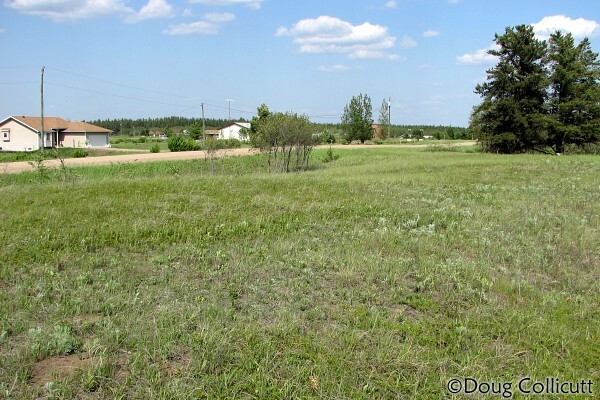 Before European settlement a relative balance existed between forests and prairie in this part of Manitoba. 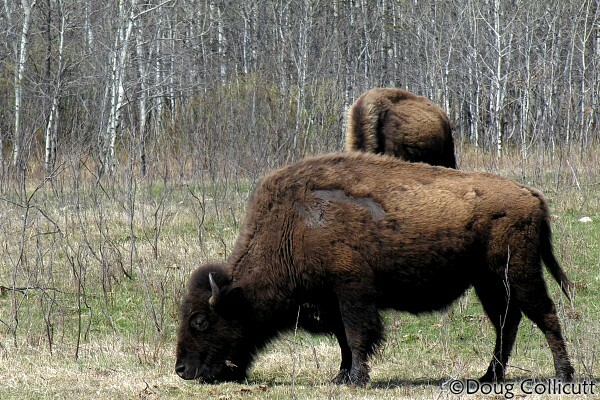 Grazing by bison and other herbivores combined with regular wildfires, some started by lightning and others by early aboriginal peoples, kept the forests at bay. 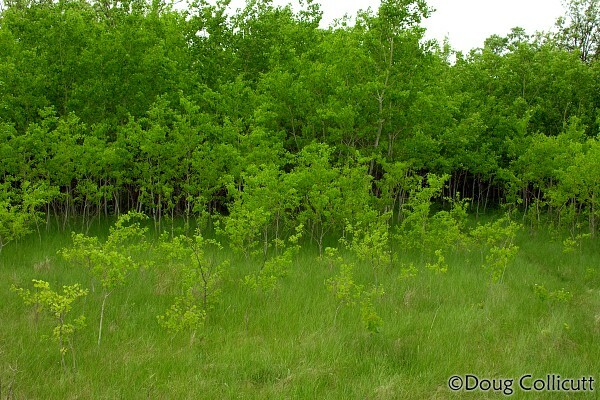 Fire suppression, and a complete lack of any grazing in some cases, have allowed aspens to proliferate and take over the prairies. the: COSEWIC Status Report on the Northern Prairie Skink (1.3 MB PDF). What about the rest of North America? You can review the North American status of prairie skinks at: NatureServe.org/Explorer = Prairie Skink. Check the box to "expand all reports sections". Wisconsin and Iowa list the skink as "vulnerable". North Dakota and Arkansas rank it as "imperiled", while Louisiana ranks it as "critically imperiled". The latter three states are on the fringes of the species range. It’s quite likely that, overall, skinks in the United States are facing the same conservation issues they face here in Manitoba. The main difference for the skinks in the United States is that they are found over a much broader geographical area. 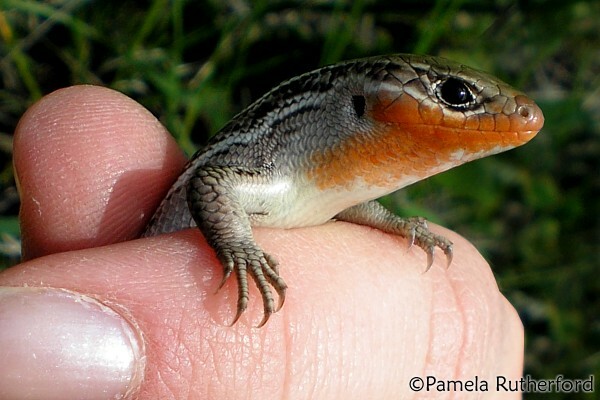 So far, skink populations in the heart of their US range are thought to be doing well. Let’s hope things stay that way for our skinks' southern cousins. Why bother with skinks anyway? Are prairie skinks important? What's so special about a tiny lizard that most of us have never even seen in the wild? Do they have some real economic value? Perhaps as a tourist attraction? Could they possess some gene or produce some compound that could be a boon to medicine? Do they play some intricate role in the ecosystem, so that other species would suffer if skinks disappeared? Maybe. But, really, it’s not very likely on any of these counts. The truth is that if skinks disappeared from Manitoba, most Manitobans wouldn’t even notice. So, should we spend the time, effort and money to try and ensure skinks have a future in Manitoba? That's something we all to need to ask ourselves, because it is individual Manitobans, like you and me, that will determine the future of prairie skinks. Sure, we all act collectively to conserve our natural resources through our government agencies. We set aside some lands as parks and protected natural areas. We enact legislation, like the Endangered Species Act, to help protect threatened plants and animals, and through our taxes we fund research to learn more about the biology of threatened species. So why not just let the government take care of the skinks? Well, governments at all levels are facing increasing demands from all sectors of society. Are skinks going to get time and money when health care and community infrastructures are in dire straits? Increasingly, it's going to be up to individual Manitobans to take responsibility for taking care of our collective natural heritage. For the roughly half of the skink's habitat in Manitoba that is on private lands this will be especially important. Individually or working in groups we can make a difference. That's what the SOS project is all about.